Kaizer Chiefs were punished for fielding a weakened side as they lost 2-1 against Ivorians Asec Mimosas in the first leg of their African Confederation Cup play-off tie. 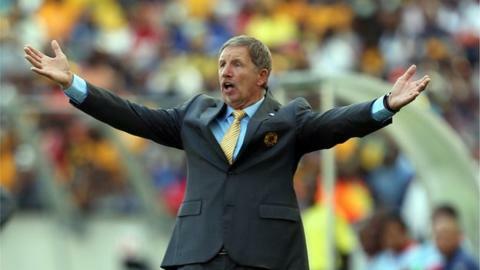 Chiefs coach Stuart Baxter made the strategic decision to put their bid for the league championship ahead of their continental title aspirations. The Englishman had already confirmed he would rest key players, preferring to save them for their three final matches of the league season plus the South African Cup semi-final next month. Asec captain Hugues Zagbayou gave the visitors from Abidjan a first-half lead in the first leg in front of a small crowd at Dobsonville Stadium in Soweto, pouncing on a loose ball off a corner to fire home. Chiefs dominated the second half and deservedly equalised four minutes from time as Zimbabwean Mathew Rusike levelled, slamming an angled half-volley across goalkeeper Badra Ali Sangare into the far corner. But Koffi Boua snatched the winner three minutes into stoppage time, stealing in unchallenged at the far post to finish off a Moussa Traore cross with his right foot. Kaizer Chiefs are chasing a second consecutive Premiership and FA Cup double, and Baxter made 10 changes to the team that won a league game at Polokwane City last Wednesday with only midfielder George Lebese retained. Baxter, the former South Africa and Finland coach, felt his team selection was justified. "We should have won this game against poor opponents. The second goal we conceded was bad with no one tracking back." Baxter has also confirmed he will be not be sending any key members of his squad to the Ivory Coast for the second leg on 27 April as Chiefs have a potentially vital game against Free State Stars three days later. Asec coach Siaka Traore was full of praise for his young side. "My boys fought tirelessly and we will return to Abidjan and prepare for the second leg." Elsewhere, Tunisians CA Bizertin drew 0-0 at Zambians Nkana with Bizertin's goalkeeper, Farouk Ben Mustapha in impressive form. Mustapha made a string of spectacular saves in Kitwe to deny the home team a goal. This was the sixth consecutive match in which Nkana failed to score, and Bizertin are favourites to win the return match next weekend. Egyptian giants Al Ahly who dropped down from the Champions League began their campaign by beating Moroccans Difaa El-Jadidi 1-0 at home. Abdallah El-Said scored for the hosts in the 21st minute to seal the victory. It was unfamiliar ground for Ahly, who won the Champions League last season and have clinched the title a record eight times. Once Ahly were eliminated from the Champions League after surprising home and away losses to Libyans Al Ahli Benghazi they were installed as Confederation Cup favourites. Return matches are scheduled for the weekend of 25-27 April and a draw in Cairo on 29 April will split the eight qualifiers into two groups.